The Dragon Gate branch is a sect of the Complete Reality school of Taoism, which integrated Buddhism and Confucianism into a comprehensive new form of Taoism. The lineage comes through Zhong LiQuan and Lu Dong-Bin who fully developed the theory and practice of Internal Alchemy of Gold Elixir about 1300 years ago. 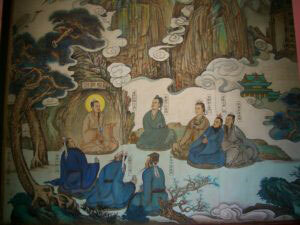 Complete Reality Taoism is divided into two main traditions, Southern and Northern. The Northern tradition of Complete Reality Taoism is rooted in the work of Wang Chongyang. The Dragon Gate sect of Taoism was an offshoot of the Northern tradition of the Complete Reality school. Its spiritual descent is traced to the thirteenth-century master Chang-chun, who was one of the great disciples of Wang Chongyang. Chang-chun, the Master of Eternal Spring, was one of the sages who advised Genghis Khan to preserve the ancient civilization of China after the Mongolian conquest, over eight hundred years ago. Genghis Khan appointed Chang-chun overseer of religions in China, and the Dragon Gate sect thus played a critical role in the conservation of Chinese culture. 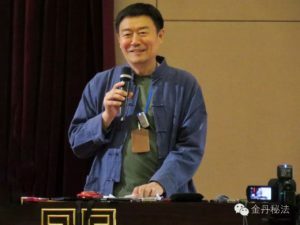 Master Wang Liping is the 18th generation lineage holder of the Dragon Gate branch of Taoism. In his childhood, he was chosen as a lineage holder by three elderly masters of Dragon Gate Taoism: Master Zhang Hedao of the 16th generation, Master Wang Jiaoming and Master Jia Jiaoyi of the 17th generation. He was subsequently educated and trained in Taoist practices for a period of fifteen years. The training includes the complete system of the Gold Elixir, and the five arts of Taoism (medicine, divination, physiognomy, fortune-telling, and cultivation). For the past thirty years, Master Wang Liping has been teaching the Gold Elixir system all over the world. For thousands of years, alchemists around the world were trying to create a pill that can fundamentally change the form of human life to achieve immortality. This pill is referred to as Elixir. One of the greatest achievements of Taoism was the development of the inner Gold Elixir system. This system is a gigantic leap in life science. The key principle of the inner Gold Elixir system is that human and universe are of one of the same and connected system. Therefore human body can be treated as a complete cosmic system that follows the same modes of operation as the exterior one. 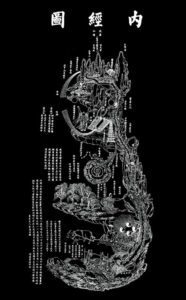 And Taoist ancestors mimicked the ancient alchemist process of creating outer Elixir inside the human body to create the inner Elixir. The Gold Elixir system can find its root in “Tao Te Ching” by Lao Tze. The system is based on teachings of Zhong Liquan and Lu Dongbin, and refined further by Wang Chongyang, Qiu Chuji and other Taoist ancestors. It is the crown jewel of the Taoist heritage. In spite of its mysterious nature of the Gold Elixir system, this system provides a set of comprehensive exercises that everyone can practice. And through practicing, one can not only achieve healthier body and sharper mind, but also elevate ones spiritual level. Our bodily existence is momentary, but through practice of the Gold Elixir system, we will be capable of raise the spiritual level of the entire world, and create a better future for all of us.